Have you ever learned about something and suddenly start noticing it everywhere? For instance, I had never really paid much attention to how many late 90s Honda civics are still on the road until I was driving one. There’s a switch in our heads for recall. This is an ideal time of year to train that human ability for recognition towards bird songs. I’ve talked about why birds sing in various articles on CHS, but to review: birds vocalize to communicate. That could be a drawn-out daily song to tell a neighbor this is that a territory has occupants. Or a raucous screech to tell everyone in the vicinity that there’s a cat roaming nearby. I find that by paying attention to bird song I see more birds, so much so that I’ll stop mid-stride when I hear a particular song or call. If you are interested in trying to see birds, a helpful skill is being able to find them by their vocalizations first. An early job of mine was as a point counter, walking transects in Northern California, recording bird abundance. You’d think I would just walk around looking for birds, but mostly I was walking around listening. I liken learning bird calls to learning a language, though undoubtedly humans fall short of fluency. I had a step up by learning at an early age, but anyone can learn a few songs. You might already know the sound, even if you don’t know who is making it. Below are a few birds I hear all over urban Puget Sound and that are common and readily found on the Hill. I always know spring is here when robins sing at dawn and dusk. They are one of the most common and vocal birds that most of us recognize by sight and sound. Robins are thrushes and their long, fluty songs betray this. However, they are extremely vocal about territorial disputes and predators. Their alarm call can clue you into something happening. Paying attention has lead me to many owls over the years. These little brown birds have a complex song that can vary greatly, like much of their family. Their loud series of chirrups are one of the earliest songs I hear. They tend to stay in the lower levels of habitat, skulking along a fenceline singing and searching out insects with their curved bills. I love this song because like robins, it means spring to me. We have a specific subspecies of White-crowned Sparrow that breeds here in the Puget Trough, called pugetensis. Widespread birds have very different songs based on distribution, like accents. Pugetensis White-crowned are vocally distinct recognizable other subspecies that migrate through our area or breed in the Cascades. Hummingbirds are not songbirds in taxonomic sense but they are very vocal. Afterall, the have to hold down their territories and make sure no one steals their flowers or nectar. You’ve undoubtedly seen this if you feed them. 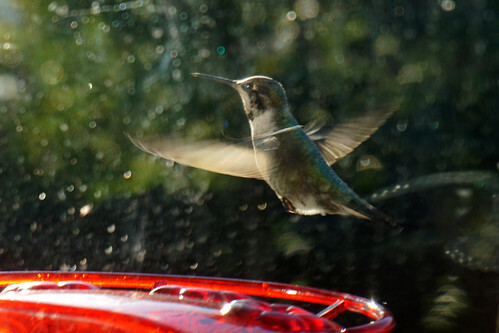 Like my Honda Civic example, once you learn to recognize their rasping call, or recognize the chirp made by their tail feathers as they dive in display, you’ll notice Anna’s Hummingbirds are everywhere in our city! Starlings are not native, but that has nothing to do with how vocal they are. I love the strange whirs, chirps, whistles, and even imitations they sing. I have been tricked more than once thinking a rare bird was singing or calling nearby, when in fact it was a starling! They are very noisy birds, amplified by their gregarious nature. Some people dislike them; I find them beautiful and wonderful. I find written descriptions of bird vocalizations hard to understand. Even the esteemed David Allen Sibley’s descriptions fall short for me a lot of the time. Don’t rely on my descriptions or even a really good recording, because birds vary by individual, place, and can sound different depending on so many environmental factors. And finally, in the spirit of pushing things forward for those of us who do know birdsong here’s some thoughts: we tend to assume that only male birds sing. This frankly isn’t true and, it appears female song has been completely overlooked by the ornithological community (which has long been been a male dominated study). Things are always changing, even songs! This entry was posted in News, etc. and tagged nature, pikes pines by Brendan McGarry. Bookmark the permalink. I can’t believe that I never put the robin and it’s song together until just a few years ago- such a beautiful song! Thank you for including the Latin names for each bird. Although I never took Latin, I enjoy the discovery process for these full scientific names. I guess Turdus is the root of thrush? Or if I call an America Robin a turd, I’m not far off…. For the past month, I’ve been digging the cacophony of goldfinch song around the neighborhood of 16th Ave E just south of Thomas. They are high up in the trees and very noisy! They’re arrival back on Capitol Hill in March is always a “spring is here!” hallmark moment for me. I know that they are supposed to be here year-round but I only ever see/hear them in the spring and summer. ?? Those early-rising robins! They’re up and singing—loudly—by 3 AM these days.